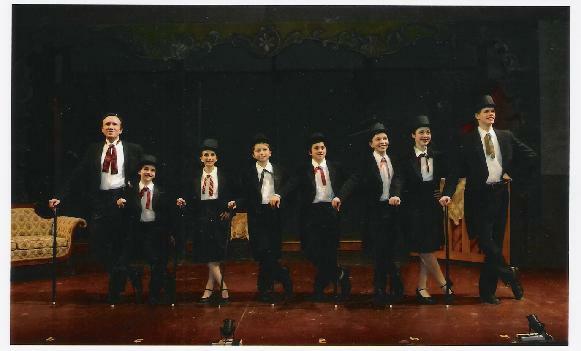 (From left to right:) Kirby Ward, Chris Campochiaro, Alyssa Campochiaro, Peter Charney, Devon Eddy, Jack Saleeby, Jillian Wipfler, Clark Kinkade in the world-premiere production of "The Seven Little Foys." 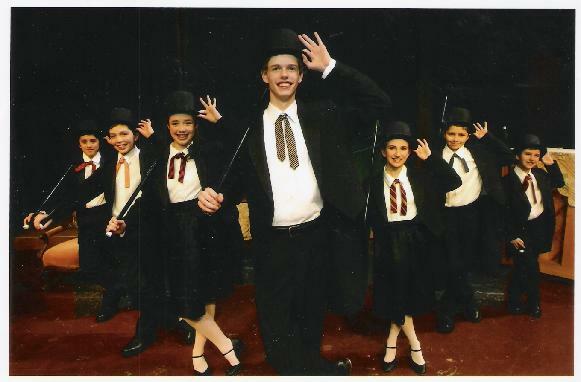 "THE SEVEN LITTLE FOYS"--Chip Deffaa's new, full-length musical comedy, had its world premiere engagement at the Seven Angels Theatre in Waterbury, Connecticut. 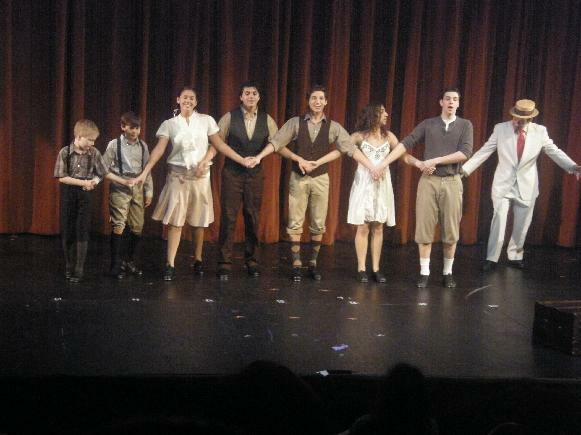 Since its Connecticut premiere, "The Seven Little Foys" has had its New York premiere engagement at the New York International Fringe Festival. The New York production garnered many raves. 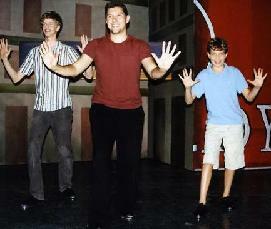 "The Seven Little Foys" is the only hit family musical to emerge on recent years the Fringe Festival. 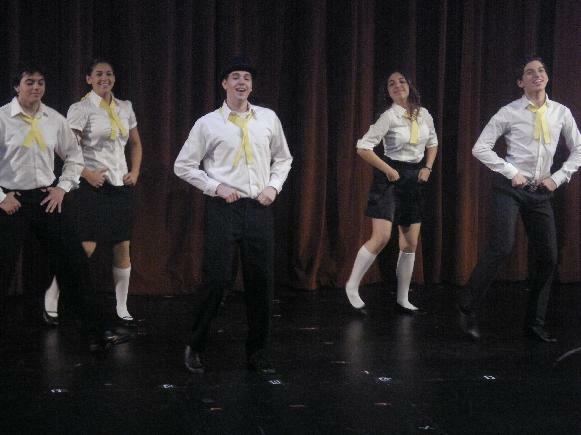 WE HAVE SET UP A WHOLE SEPARATE PAGE ON OUR WEBSITE ABOUT THE NEW YORK PRODUCTION--"FOYS AT THE FRINGE." 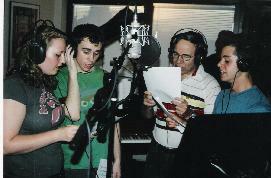 We are currently in the process of a recording a "Seven Little Foys" cast album. We've set up a separate page on this website, devoted to that project, titled "Seven Foys Cast Album." 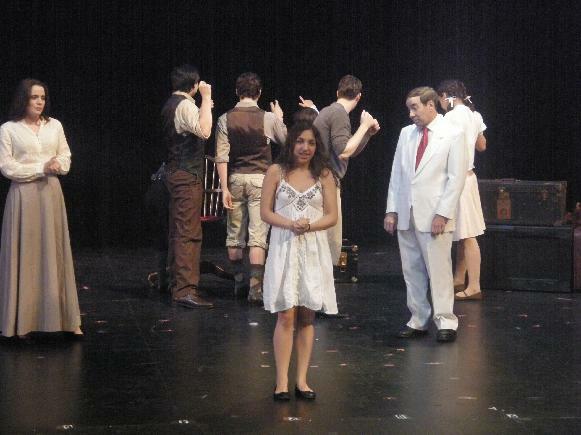 (From left to right:) Jack Saleeby, Alyssa Campochiaro, Clark Kinkade, Raissa Katona Bennett, Kirby Ward, Peter Charney, Jillian Wiplfler, Devon Eddy in the Connecticut production. 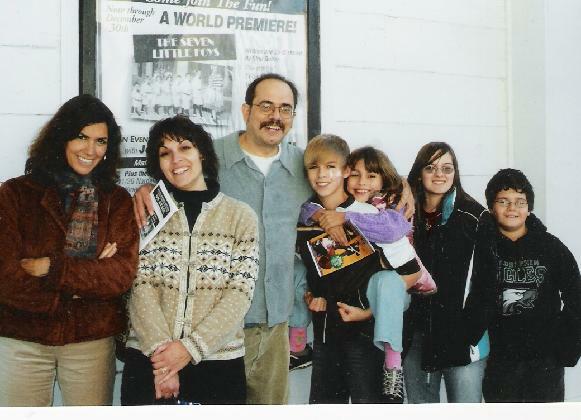 In its Connecticut premiere engagement, The New Britain Herald hailed "The Seven Little Foys" as "a delightful holiday present for the whole family.... Let the Seven Little Foys march straight into your heart as their father, Eddie, leads them into becoming a true red, white and blue American institution." 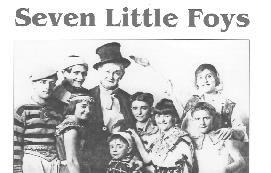 Inspired by actual events, "The Seven Little Foys" tells the story of Eddie Foy, who took his seven kids into vaudeville with him. They became, against odds, the most popular family act of the day. Performing out on the road in arduous tours, following the death of their mother, the Foy kids gained a deeper understanding of the importance of family. The show is written for three adult actors (portraying Eddie Foy, his wife, and their friend George M. Cohan), plus seven kids. 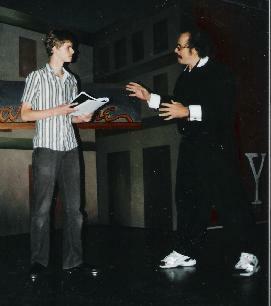 In the photo at right, playwright/director Chip Deffaa works with Clark Kinkade, who (in the original production) portrayed the oldest of the Foy children. Audiences love seeing kids sing and dance on stage. 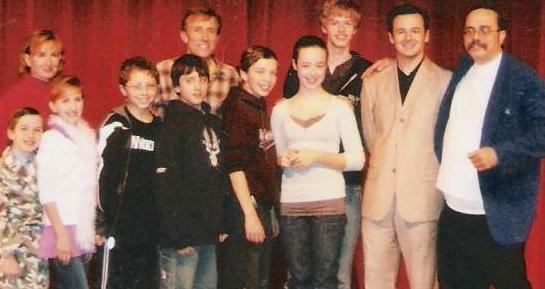 And in the original production, the exuberant kids often seemed to steal the show! 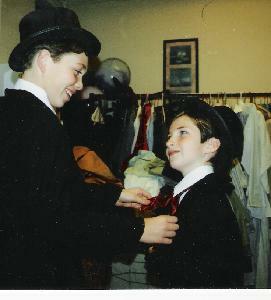 In the photo at left, two of the younger actors in the show, Jack Saleeby and Chris Campochiaro, get ready to go on stage. Kirby Ward, who starred as Eddie Foy in the world-premiere production of "The Seven Little Foys," has appeared on Broadway in "Showboat," "Never Gonna Dance," and "Woman of the Year." 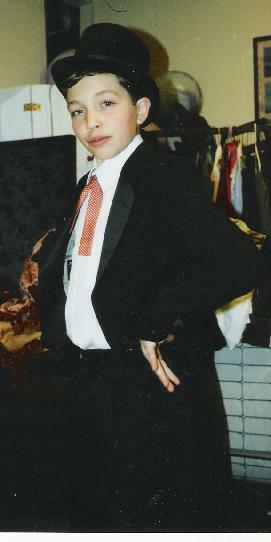 He received an Olivier Award nomination for his work in the West End premiere of "Crazy For You." His film and TV credits include: "For the Boys," "Pennies from Heaven," S.O.B," "Law and Order: SVU," and "The Tonight Show." For more info, please visit: www.KirbyWard.com. Colin Pritchard, who played George M. Cohan, has toured nationally and internationally in "42nd Street." He may be heard on a new CD, singing songs of Cohan with the Paragon Ragtime Orchestra. He's also worked in the development process (doing readings and demo recordings) of several of Chip Deffaa's shows. Raissa Katona Bennett, who played Mrs. Foy, has appeared on Broadway in "Phantom of the Opera," and in the national tours of "Cats," "Parade," and "A Child's Christmas in Wales." For more info: www.raissa.info. The score of the show mixes nostalgic favorites like "Shine On Harvest Moon," "Moonlight Bay," and "Meet Me Tonight in Dreamland" with spirited new originals by Chip Deffaa. Plenty of good opportunities for dancing, too! 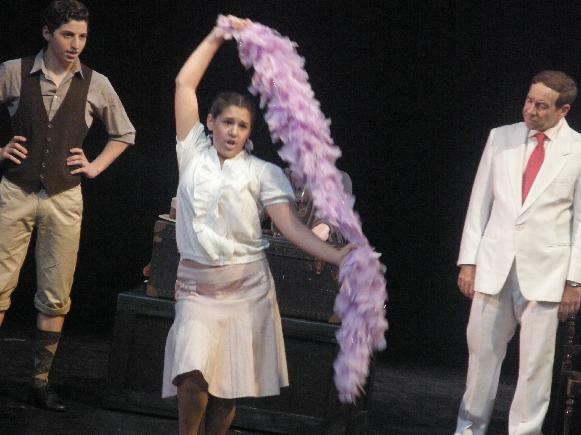 Choreographer Justin Boccitto and Assistant Choreographer Cristina Marie, from our world-premiere production in Connecticut, returned to choreograph the New York premiere of "The Seven Little Foys" at the 2008 Fringe Festival. 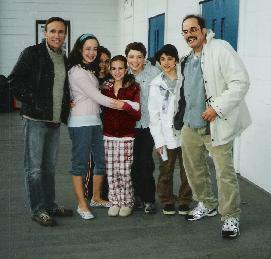 In the photo at right, Chip Deffaa (far right) joins cast members Kirby Ward, Jillian Wipfler, Peter Charney, Alyssa Campochiaro, Jack Saleeby, and Devon Eddy after a performance. 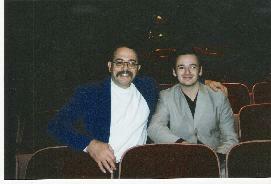 Actor Ryan Foy, a great-grandson of Eddie Foy Sr. (and a grandson of Irving Foy), with playwright/director Chip Deffaa. 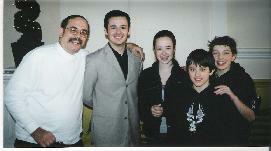 Cast members were thrilled when actor Ryan Foy--a great-grandson of Eddie Foy Sr.--came to see the show. He had a great time. And we invited him to be part of the next production. 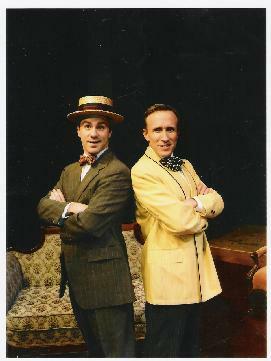 When the show had its New York premiere, Ryan Foy was in the cast--playing the role of George M. Cohan--and delighting all reviewers. "A truly magical surprise," declared the Village Voice of Foy's performance. "He lights up the stage whenever he appears." Chris Campochiaro, Raissa Katona Bennett, Alyssa Campochiaro, Peter Charney, Devon Eddy, Kirby Ward, Jack Saleeby, Jillian Wipfler, Clark Kinkade, Ryan Foy, Chip Deffaa. 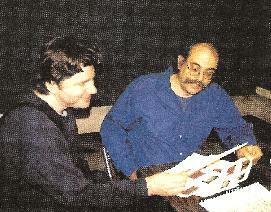 Set designer Tony Andea shows playwright Chip Deffaa his designs for "The Seven Little Foys." The number is featured in "The Seven Little Foys," performed by Eddie and the kids. 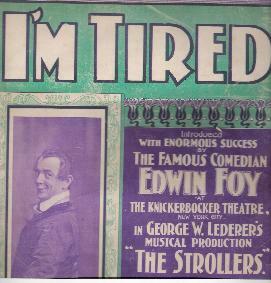 Even in the final year of his life--working as a single again after his seven kids had all flown the nest--Eddie Foy set records at the Palace Theater, the Mecca of vaudeville. 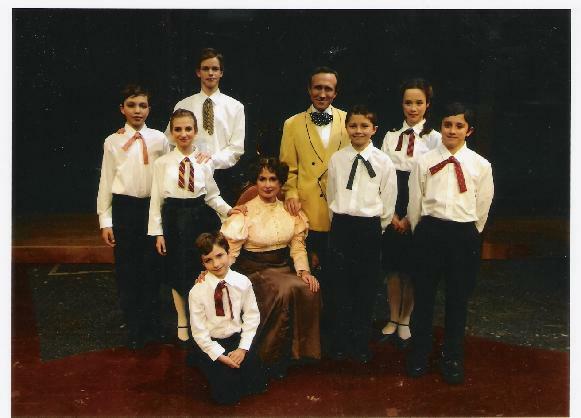 This page is primarily devoted to the world-premiere production of "The Seven Little Foys" on Connecticut. 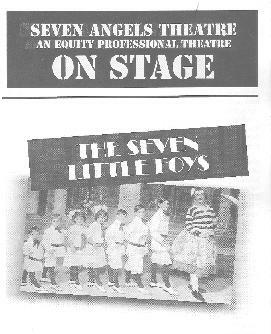 Please be sure to check out our page on this website about the New York production of "The Seven Little Foys"--"FOYS AT THE FRINGE." No show in that year's New York International Fringe Festival got more favorable press attention than "The Seven Little Foys." Like all of Chip Deffaa's shows, "THE SEVEN LITTLE FOYS" is available for licensing; we can provide the script, score, and demo recordings--everything you need to mount a production of your own. Making "Seven Little Foys" demo recordings: Sophia Howes, David Cronin, Michael Townsend Wright, Paul Iacono. 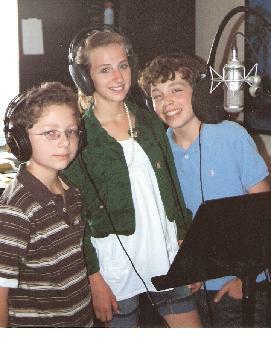 Peter Charney, Alyssa Campochiaro, Jack Saleeby recording "Seven Little Foys" demo's. "The Seven Little Foys" works for audiences of all ages. Whether you're a school, a regional theater, or an independent producer, you'll find that this heart-warming musical provides great entertainment. Terrific opportunities for dancing, too! "The Seven Little Foys" was a great success at the NEW YORK INTERNATIONAL FRINGE FESTIVAL, scoring big with both reviewers and the public. We have a separate page on this website, devoted just to that event. CHECK OUT THE PAGE TITLED "FOYS AT THE FRINGE FESTIVAL." "THE SEVEN LITTLE FOYS" is written for 10 singing actors. If you're interested in doing a musical about this family of entertainers but would prefer a script with roles for more actors, check out "THE FAMILY THAT SINGS TOGETHER..." (which has 22 speaking parts) and "SONG-AND-DANCE KIDS" (which has 37 speaking parts). Those are our bigger-cast musicals about the Foys.